A landmark study of academic grades of 1.6 million students has shown that girls and boys perform very similarly in STEM – including at the top of the class. A new study, led by UNSW Sydney PhD student Rose O’Dea, has explored patterns in academic grades of 1.6 million students, showing that girls and boys perform very similarly in STEM – including at the top of the class. The analysis, published today in prestigious journal Nature Communications, casts doubt on the view that there are fewer women in STEM-related jobs because they aren’t as capable in those subjects as men – a notion that has been supported by the concept that gender differences in variability lead to gender gaps in associated fields. In their meta-analysis, the UNSW researchers compared gender differences in variation of academic grades from over 1.6 million students aged six through to university from all over the world, across 268 different schools and classrooms. “We combined data from hundreds of studies, and used a method developed by my supervisor to comprehensively test for greater male variability in academic performance,” lead author Rose O’Dea says. A classroom with more variable grades indicates a bigger gap between high and low performing students, and greater male variability could result in boys outnumbering girls at the top and bottom of the class. “Greater male variability is an old idea that people have used to claim that there will always be more male geniuses – and fools – in society,” O’Dea says. The team found that on average, girls’ grades were higher than boys’, and girls’ grades were less variable than boys’. “We already knew that girls routinely outperform boys at school, and we also expected female grades to be less variable than those of males, so that wasn’t surprising. In fact, our study suggests that these two factors haven’t changed in 80 years,” O’Dea says. In other words, the researchers demonstrated that academic STEM achievements of boys and girls are very similar – in fact, the analysis suggests that the top 10% of a class contained equal numbers of girls and boys. O’Dea says that there are multiple reasons that these figures don’t translate into equivalent participation in STEM jobs later in life. “Even if men and women have equal abilities, STEM isn’t an equal playing field for women – and so women often go down paths with less male competition. “For example, we found that the ability overlap between girls and boys is much greater in STEM, and smaller in non-STEM subjects, meaning that there are fewer boys competing with girls in non-STEM subjects. Stereotypical societal beliefs about what fields girls are seen to be successful in also play a role. “Girls are susceptible to conforming to stereotypes in the traditionally male-dominated fields of STEM. Girls who try to succeed in these fields are often hindered by backlash effects,” O’Dea says. O’Dea says that there’s no simple fix to work on the underrepresentation of women in STEM. Professor Emma Johnston, Dean of Science at UNSW, says a lot needs to be done to encourage girls to choose a STEM path. “This powerful, evidence-based research has revealed that girls and boys are equally good at STEM subjects. Differential participation in STEM training and STEM careers must therefore be explained by other factors. 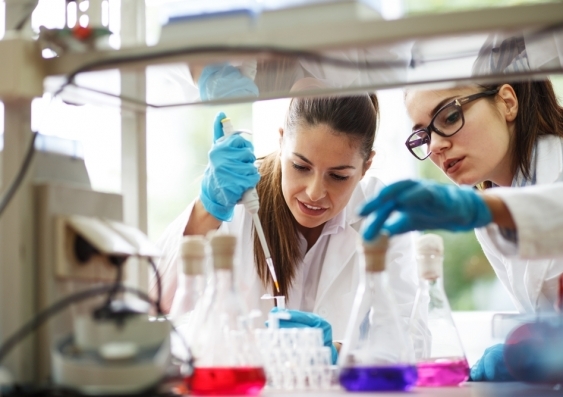 “Australia really needs more women to enter, stay, and succeed in STEM areas. We absolutely need to change the structural barriers to gender equality in science, but we must also change the strong negative stereotypes and unconscious biases as well. We must give our girls and women more successful science role models – something grand to aspire to. “We all need to actively work to close this gap – for example, UNSW’s Women in Maths and Science Champions Program is a unique opportunity to support women who are completing their PhD in UNSW Science. The program focuses on strengthening the cohort’s communication and leadership skills to support their professional careers and their lifelong role of advocacy to inspire women to pursue a career in maths and science. “The author of this landmark study is a great example – Rose is an incredible role model and her leadership in traditionally male-dominated fields like science and the AFL is inspiring to many girls,” Professor Johnston concludes. Welcome to UNSW Australia (The University of New South Wales), one of Australia’s leading research and teaching universities. At UNSW, we take pride in the broad range and high quality of our teaching programs. Our teaching gains strength and currency from our research activities, strong industry links and our international nature; UNSW has a strong regional and global engagement. In developing new ideas and promoting lasting knowledge we are creating an academic environment where outstanding students and scholars from around the world can be inspired to excel in their programs of study and research. Partnerships with both local and global communities allow UNSW to share knowledge, debate and research outcomes. UNSW’s public events include concert performances, open days and public forums on issues such as the environment, healthcare and global politics. We encourage you to explore the UNSW website so you can find out more about what we do. According to recent research conducted by the US National Science Foundation (NSF), although women comprise more than half of the U.S. workforce, only 28% are employed in STEM related fields and of that, only 11% are pursuing a career in information security. Similarly, when looking at workplace diversity, minorities represented 29% of STEM related fields, with approximately 6% Hispanic and 8% African-American representation in the IT sector. Leading ladies. 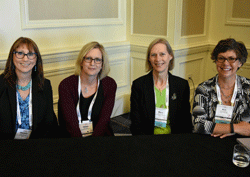 Participants in a gender and diversity panel at the Internet2 Technology Exchange. From left, Theresa Semmens, Helen Patton, Mary Dunker, and Kimberly Milford. Courtesy Internet2. When asked why women chose to leave the profession or why they might not consider a career in information security and IT, often the answers are as complex as the problem. Some cite stereotyping, organizational culture, and the lack of encouragement and support from management and fellow colleagues. Others cite the lack of guidance from management and uncertainty about their career trajectory. Moving forward, my co-panelists and I offer the following guiding principles to anyone interested in supporting gender and diversity initiatives. Gender discrimination is not just a women’s issue – it’s a men’s issue, too. Similarly, making concerted efforts to challenge the lack of diversity in the workplace should be everyone’s concern. It’s important to include both men and women in the conversation and work collectively at solving the gender discrimination and diversity problems in the workplace. Many of our male colleagues have expressed their desire to put an end to gender discrimination and make real change to improve diversity. There needs to be tools and resources, such as this one about male allies, that help our colleagues become allies for women both at work and at home. It’s important to move beyond simply presenting the data on gender discrimination in the workplace. In addition to making tools accessible, we must highlight possible solutions and share success stories alongside the data. A good reference for this is the National Center for Women and Information Technology (NCWIT). Target practices. Building on insights from behavioral economics, Iris Bohnet argues that to overcome gender bias in organizations and society, we should focus on de-biasing systems — how we evaluate performance, hire, promote, structure tests, form groups — rather than on trying to de-bias people. Another great resource is Iris Bohnet’s book What Works – Gender Diversity by Design, which makes suggestions on ways we can recruit, hire, develop, and promote gender diverse talent. We want to be conscious of how we present the profession through the use of language. We want to avoid using terms and descriptions that may come across as biased, either consciously or unconsciously. We want to ensure the terms and language we use are gender-inclusive. A coach, mentor, or advocate will instill in the person seeking help and advice the idea that they can make a difference and are valued for their contributions. Mentorship forms a support system that enhances a positive experience of growth and development for an individual’s career. Research suggests that the most beneficial mentoring is based on mutual learning, active engagement, and striving to push the leadership capabilities of mentees. We need to ensure that everyone who has an interest and desire to break into information security has the opportunity, comfort level, and confidence to do so. Diversity in the workplace contributes to an institution’s creativity and adds new perspectives to professional conversations. It creates a well-rounded team and allows for more efficiencies, diverse ideas, varied technical skill sets, broader communication forums, and business management skill sets. Women and minorities need champions; those who advocate, support, and recognize their efforts and contributions.